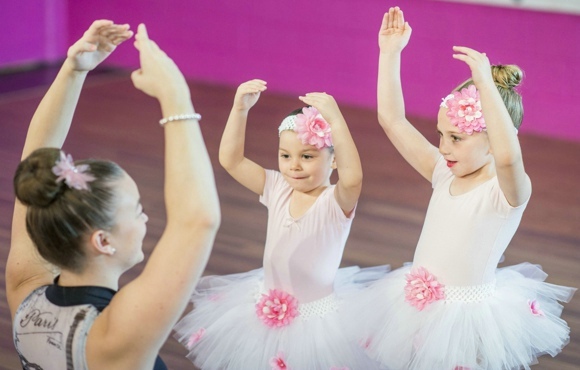 Being the parent of a young dancer, especially if you've never danced before, can be an intimidating and challenging experience. One moment you're dropping your child off at dance class to learn some steps and burn some energy. When they hop back in the car an hour later, they're excitedly rattling off a million class notes a minute--filled with words you may or may not understand. 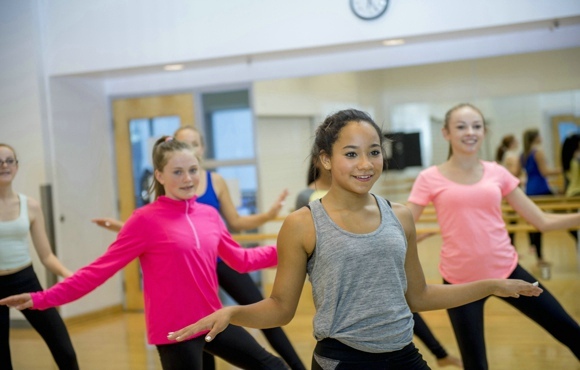 Dance season can be a long, bewildering year. But if you're prepared with a little knowledge of what your child will experience, you can engage in the conversation and even help solve resolve issues along the way. From plié and tendu to the top of the count and marked movement, dancers speak a different language in the studio. No matter the style, it boils down to technique first. 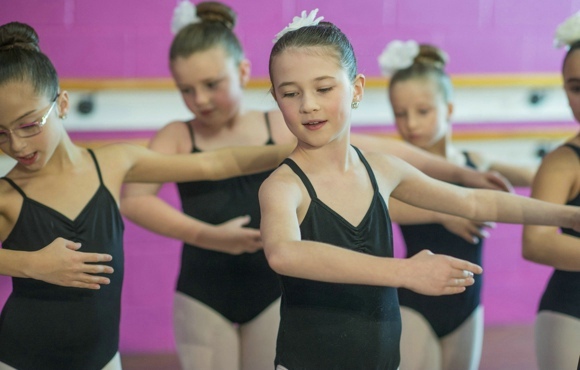 When your child steps into his or her first class, the instructor will teach these common positions to help shape their dance technique. • Arabesque [a-ra-BESK]: A pose with one leg stretched straight out to the back. • Assemble [a-sahm-BLAY]: A jump from one foot landing on two feet. • Barre [bar]: The wooden railing fastened to the walls of the dance studio. • Chasse [sha-SAY]: The working leg slides out from the supporting leg and pushes off the ground, the supporting leg comes to the working leg in the air and lands in its place. • Count: Many styles will count the beat of the music by threes, fours or eights. This is how the dancer puts movement to the beat of the music and helps keep dancers uniform and on the same pace. • Demi-plie [duh-MEE-plee-AY]: Half-bend of the knees without the heels leaving the floor. • Jete [zhuh-TAY]: A jump from one foot to the other in which the working leg appears to have been thrown (think leap). • Mark: A walk-through of choreography in which movement is not done to its fullest potential. 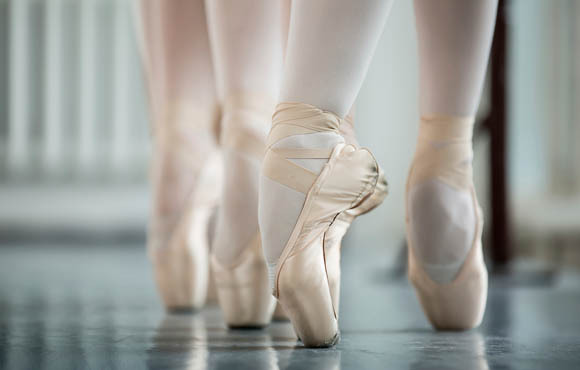 • Pirouette [peer-oh-WET]: A turn of the body, standing on the supporting leg while the working leg is usually in retire (leg is bent upwards, with toes typically connected to the other leg, turned out). • Plie [plee-AY]: To bend the knee(s). • Releve [ruhl-VAY]: A raising of the heels. • Rond de jambe [rawn duh zhahmb]: A circular movement of the leg. • Tendu [tahn-DEW]: The working foot slides from the supporting leg without lifting the toe from the ground until the toe has reached a full pointe. • The Five Positions: First, second, third, fourth and fifth position are common barre exercises in ballet class. A dancer's bag should contain shoes, a bottle of water, granola bars or other snacks, hair ties, bobby pins and post-class sweats or a sweater. 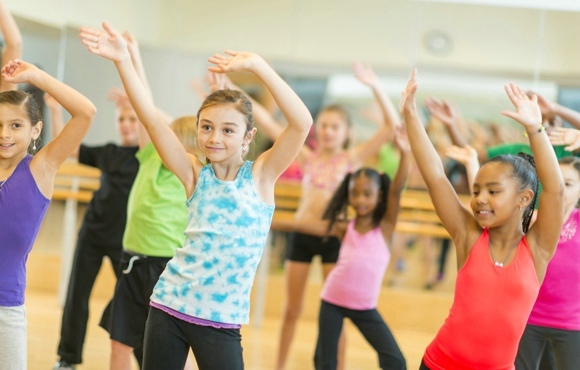 Your child should wear regular shoes to the studio and change into his or her dance shoes once they get there. 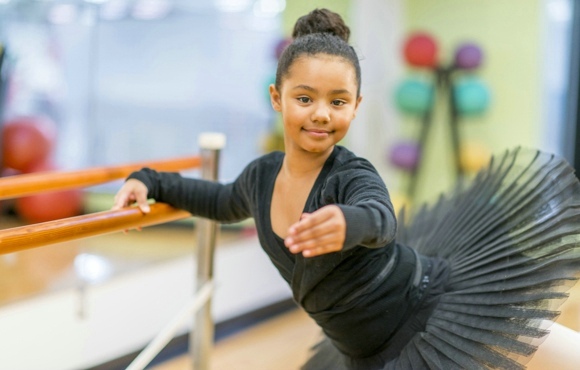 If your child has multiple classes in a day, make sure the bag is packed with the appropriate attire for each class–ask your studio director for requirements. 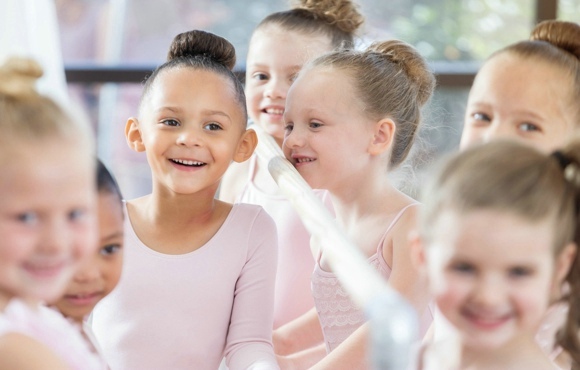 During class or recital season, your young dancer will go through a lot of hair spray and bobby pins. Purchase a big box of pins and multiple bottles of hairspray so you're never scrambling if you run out or if your little one loses anything. Plus, if another dance parent needs these items, you'll be the class hero! Stretching is a major component of a dancer's life. Without flexibility, their range of motion is limited, making jumps, turns and other movements look weak. At night while watching TV, don't be surprised if you see your little one attempting to do the splits or other stretches. You may even find your ballerina practicing the five positions while brushing her teeth. Spotting is a common dance technique. While spinning, the eyes pick one spot and the body does the work. This helps the dancer avoid dizziness and maintain balance and posture. When children first learn this technique they are encouraged to practice at home. Don't be alarmed if your child is in the corner of a room spinning; they're merely practicing how to spot. According to the National Eating Disorders Association (NEDA), 40 to 60 percent of girls ages 6 to 12 are concerned about becoming too fat or gaining weight. Issues can arise when costumes reveal too much. Be a role model and show your healthy habits. Let your child pack lunches and cook dinner so she learns how food helps fuel her activities. NEDA also suggests you talk about yourself with respect because others pay attention to you and will learn how to appreciate their body image.